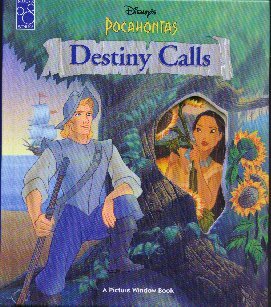 " Disney's Pocahontas - A Picture Window Book"
(591)1995 - Disney's Pocahontas - A Picture Window Book.-Condition: Superior - Like New Beautiful Cel-Like Paintings bring the world of Pocahontas to life! This is really a unique picture book with clear covered windows on every other page. The art work in this book is really beautiful! It is entitled : Destiny Calls. It is Hardbacked with Glossy Cover. The pages are thick cardboard. The Book measures 7" by 8". Price: $7.00 + shipping.